A racing car themed toy box. Do you drive in red or blue? The Formula Blue Toy Box is part of the Formula Blue Collection of children's bedroom furniture. This blue themed kids toy box has a hinged lid and also is available to order in red. 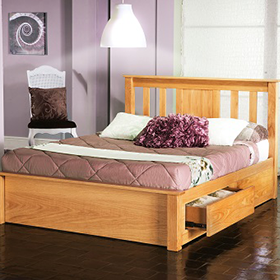 Complete matching bedroom range available. All items are delivered flat-packed for easy self assembly - contact us if service is required. Delivery of The Formula Blue Toy Box in approx. 3 - 5 weeks.